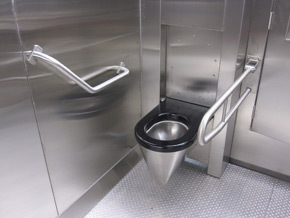 LORKE Systems has developed its toilet units always bearing in mind current regulations of accessibility and reference European norms on this subject matter. The obligation of facilitating toilet use to all persons has involved numerous modifications in the design of our cabins. In the end total accessibility has prevailed and we have developed self-cleaning toilet cabins truly prepared for access by the disabled. In the space assigned to the distribution of the toilets you could draw a circle 1.80 m in diameter free of obstacles. The minimum width of doorway entrance, both in the space designated to the layout and in the adapted toilet cabin is 0.90 meters. The doors always open outwards. The toilets have automatic opening and luminous and acoustic signals. The urinals are placed alongside each other without a minimum distance to the floor, as their design rules out any other alternative. There is an acoustic alarm system for emergencies 0.40 m. from the floor. The compartment has a turning radius of 1.80 m. This measurement is the one recommended by law and is already in application in other European countries. At the present time certain towns in Spain demand these dimensions in public toilets in the hotel and catering business. The washbasin is without a pedestal and is positioned at a height below 0.80 m.
The flooring complies with safety standards as the interior covering is made of non-slip vitreous glass mosaic tiles. The lower edge of the mirror is positioned 0.80 metres from the floor. The hook is at a height of 1.00 metre. The toilet bowl is at a height of 45 cm. and its exterior edge is 70 cm. from the wall, leaving a clearance of 80 cm. for movement. The seat is placed at a height of 45 cm. and has a secured extensible support bar. The improvement of 1.80 m. turning radius recommended by law we know has been well received by the disabled. All Lorke toilets combine the most up-to-date GPRS communication, the most resistant materials, the best finishes, the most effective self-cleaning system, the best quality and total accessibility. Experience in this type of product has been decisive in shaping the fundamental characteristic aspects of our toilets. We know first hand what our client is looking for in amenities of these characteristics and this is what we have reflected in the final product. Today LORKE Systems S.L. offers a star product in the market, developed by highly qualified staff, up-to-date with the latest industrial technology and availing of the most modern and efficient equipment.